The track includes some short steep sections where you will need to take care. Approximately 3km walking. Please ensure you have confident walking skills before booking this tour. Highlights: Aboriginal carving, stunning cliff-top views, learn about natural and cultural heritage of the local area. Spectacular mountain views over rainforest gorge. Explore new building sites. Finish off the tour with an exciting 4WD transfer back to your car. Light lunch included - Bushman's style gourmet sandwich platter, muffins and a refreshing drink will be served on the tour. 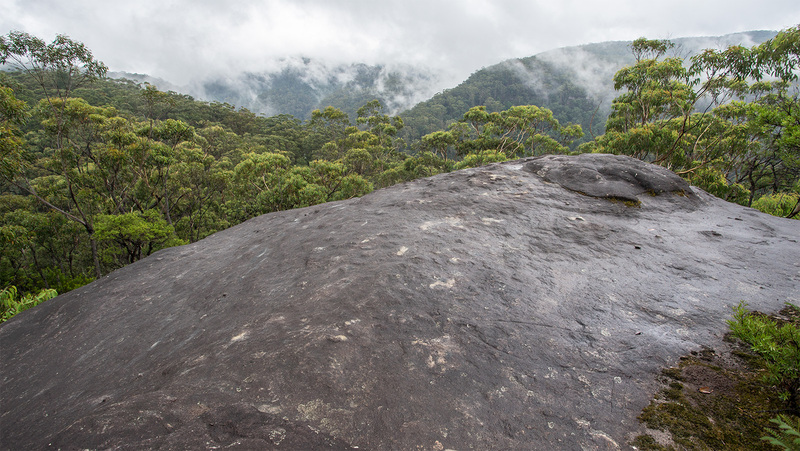 For the vast ridges and complex secret canyons of the Wollemi Wilderness have remained a mysterious relic to the ancient, primitive beauty of this great country. Still largely unvisited by Europeans, the Wollemi’s impenetrable, rugged interior has kept its many mysteries and wonders well hidden from the thousands of tourists that visit the Blue Mountains region only a short distance to the south. So it might be hard to believe that only a short drive from Sydney you can now visit a preserved section of this raw natural wilderness normally unseen. A place that feels so remote and delivers such an intimate experience of this world-heritage wilderness. As you drive through the gates of our heritage wilderness property you enter into your own private section of the Wollemi wilderness. Surrounded by the world heritage zone on three boundaries, the property operates as a small eco-development with a variety of sustainable built cabins available for weekend getaways. Cabins include Tipis, a Treehouse and the recently completed Enchanted Cave, amongst other award winning designs. Built by renowned environmental builder and designer Lionel BuckeTt, emphasis is placed on using locally sourced natural materials to redefine the boundary between interior and exterior. A common theme in his buildings is a continuum of natural bush aesthetic between the outside environment and internal space of the building – the “flow” of the bush is drawn inside through the clever use of natural product, such as raw colours, tree branches and overall design. Set on a historically significant private wilderness property along Bells Line of Road between Bilpin and Mount Tomah Botanic Gardens, short guided tours are now being offered into some of the most spectacular Wollemi bushland in the region. The tour kicks off with a casual look at the next cabin-in-progress and also provides the first of many lookouts over the gorge. Leaving this contemporary man-made scene quickly behind the group heads off into the bush to discover a hidden cliff-top aboriginal engraving situated along the escarpment. Stories emerge of the European frontier settlers and their early harmonious existence with the local indigenous people on this property. 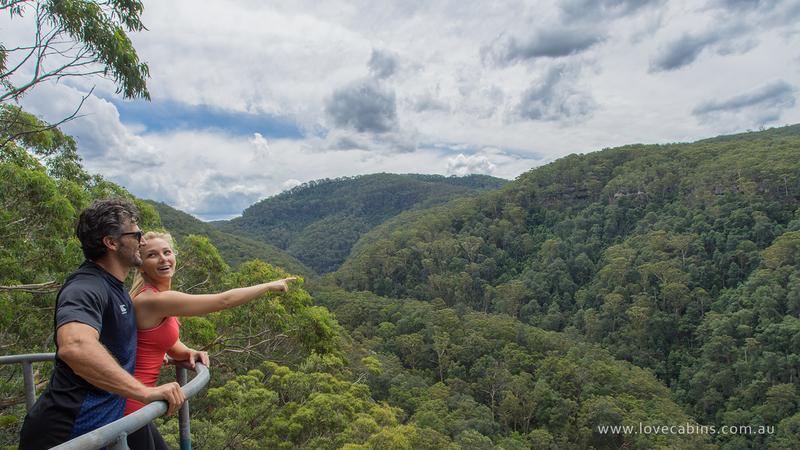 Vantage points along the track let you peer out across the deep Bowens Creek ravine for an intimate experience of the Wollemi. 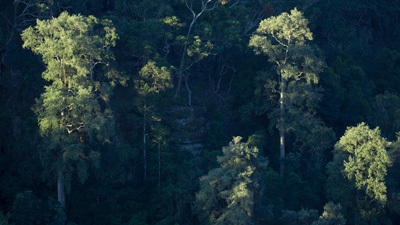 It’s not uncommon to spot a flock of Black Cockatoos or hear the pleasant calls of the Lyrebird below. Stopping at the main lookout you will see stands of rare Blue Mountains Montane Rainforest or “Cloud Forest” up on the Mountains – a special form of higher altitude rainforest that survives by drawing moisture from mist and fog that regularly forms in the valley - creating a unique microclimate. Thriving in the basalt rich soils of the region, this rich forest eco-system is almost completely void of Eucalyptus (Gum Tree). Looking almost directly down upon the rainforest canopy you will learn about the different types of rainforest flora varieties and their sought-after timber products - a demand that nearly devastated some species in the past. You will also experience how the rugged terrain formed an impassable barrier which “locked-out” early logging attempts and preserved the towering Turpentine trees still visible today. Various pioneering efforts from the early1820s - 1830s are still evident in the valley below. Visible relics include a 2km length of convict built bullock track, convict sawmill ruins submerged in the creek and a nearby quarry site. In the years that followed. subsequent generations and owners of the property have played pivotal roles in the 20th century development of national parks in NSW. The tour finishes with a short and exciting 4WD trip to another lookout (and future Treehouse site) before dropping participants back at thier cars.